A little extra support can go a long way and that’s exactly what you’ll find in the Pocketopia Capri. This capri is the sister to the Redemption Capri because it fits the same, but it has 2 more pockets! Yes, that’s 4 pockets total! You are in Pocketopia with this new capri! There is one pocket on each leg, plus a key pocket in the waistband and a zipper pocket in the back. 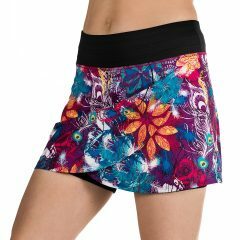 Designed to help you tackle any workout in comfort and style, this capri features comfortably compressive fabric that hugs your muscles to keep them fresh from warm-up to cool-down. Its contoured waistband won’t dig or bind so you can focus on your workout.